Velcro Companies introduces the new Professional Series Trade Range for construction and commercial applications. 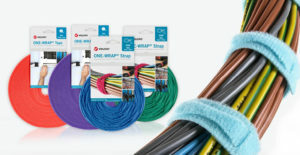 This suite of hook-and-loop straps and tape features newly designed packaging that allows professionals to quickly and easily find the perfect products for their structural needs. The Industrial Trade Range products are divided into 3 sections: General Purpose, High Performance and Straps & Ties. There is a product for every application! Consider this: Two inches off on a measurement could cost an entire sheet of material, hardware, and cause potential surface damage with traditional fasteners. The products from our VELCRO® Brand Trade Range, for example the VELCRO® Brand adhesive backed fasteners, allow the user to re-position material as if it never happened. Saving valuable time and materials. VELCRO® Brand ONE-WRAP® Fasteners allow you to bundle cables, cords and wires in a smart and safe way. They are strong, reusable, adjustable and gently protect fragile wires. This wide range of fasteners in customisable sizes, coulours and combinations offer you infinitely smart solutions for all you Cable Management Needs. Our ONE-WRAP® tape and straps are the safe, reusable, adjustable alternative to plastic cable ties making it a more sustainable product for the environment.